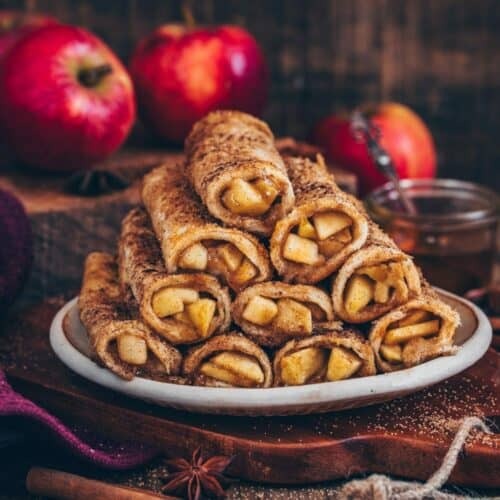 These vegan oven baked Apple Toast Roll-Ups are super easy to make in just 20 minutes. 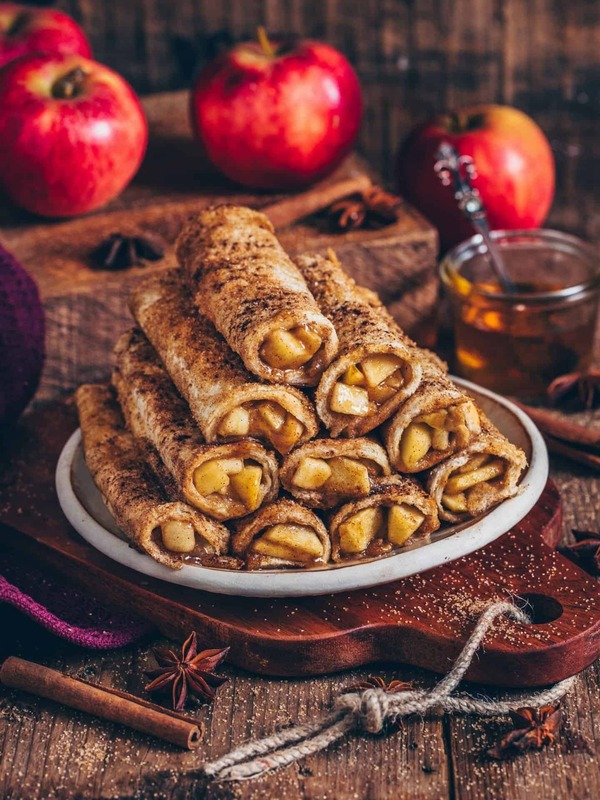 It’s a delicious breakfast or dessert with a sweet apple cinnamon filling. Serve these vegan French Toast warm and crispy for a perfect snack. 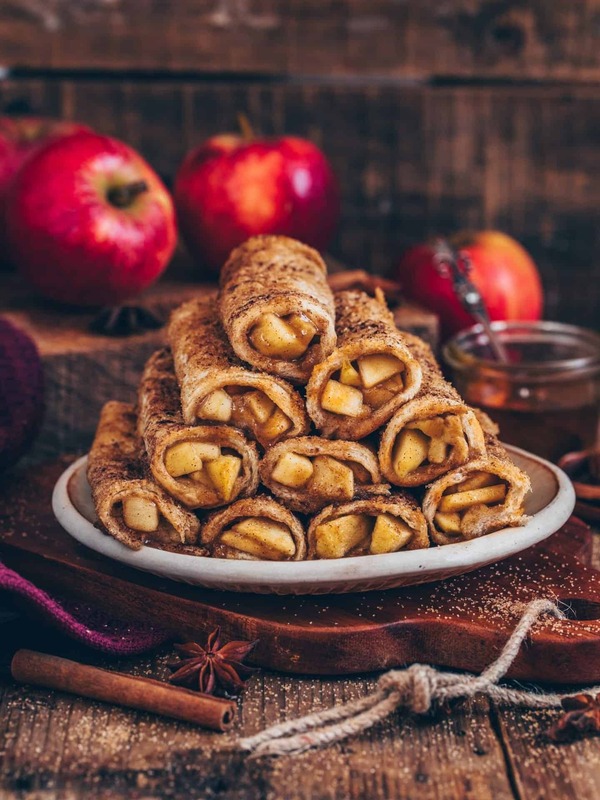 Apple pie has always been one of my most favorite desserts, and I am also addicted to Vegan Crêpes Roll-Ups. 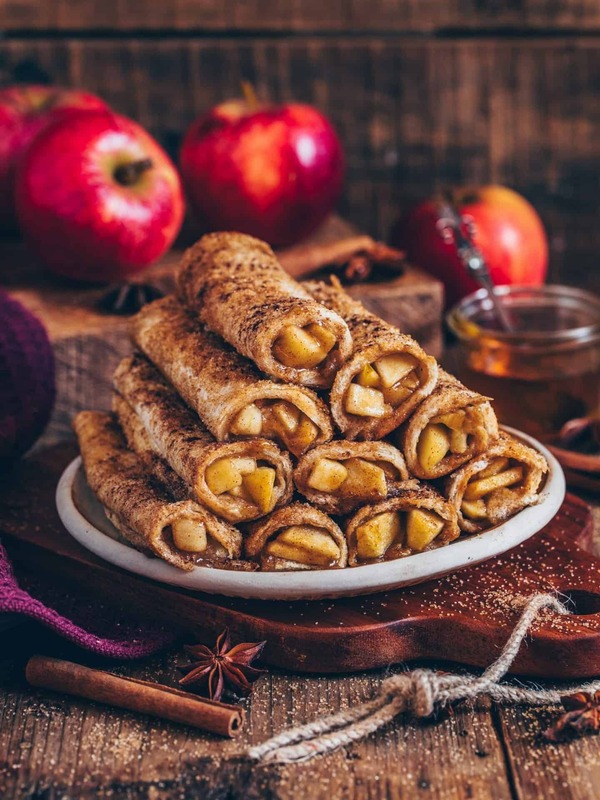 As I was thinking about what kind of new Apple pie treat I should try next, I had the idea to make some yummy Apple Pie Roll-Ups. 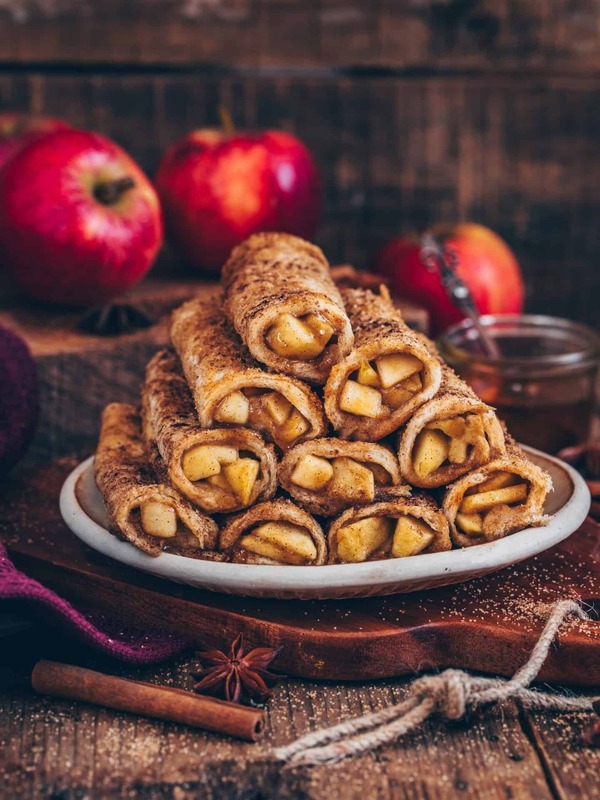 However, it’s not so easy to make a stack of Crêpes which are filled with cinnamon apples, because they’re too soft, so the filling falls out easily. 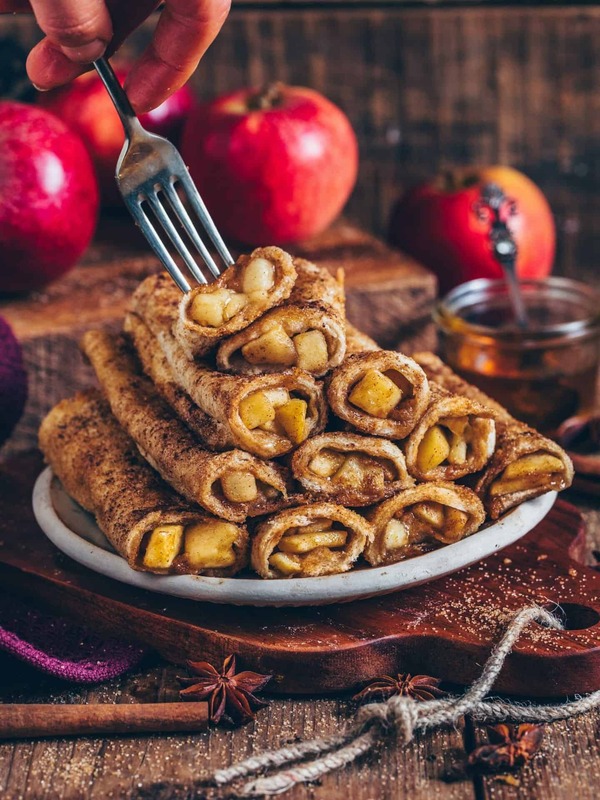 I figured out that it could be a great idea to stuff the Apple Cinnamon mixture into a flatten slice of toast, then roll it up, cover with cinnamon and brown sugar and bake until warm and crispy. Believe me guys, they turned out so good! 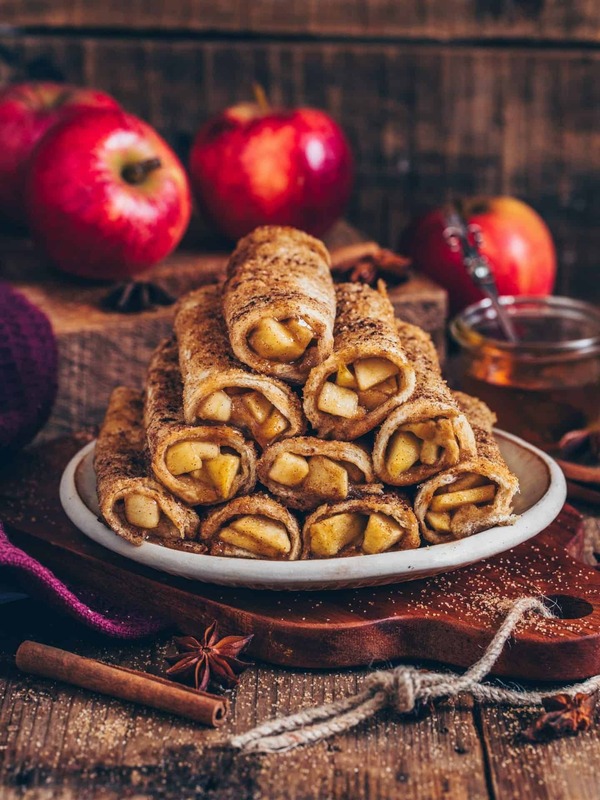 They taste really like an apple pie – simply rolled up in a Toast. You should definitely give this recipe a try! I love that these Toast Roll-Ups are oven BAKED and NOT FRIED, so they contain less fat than regular French Toasts which are fried in tons of oil. Plus they take just 20 minutes to make and you need only a few simple ingredients you likely already have on hand. You could also make them lower in sugar by using brown erythritrol, if you prefer. 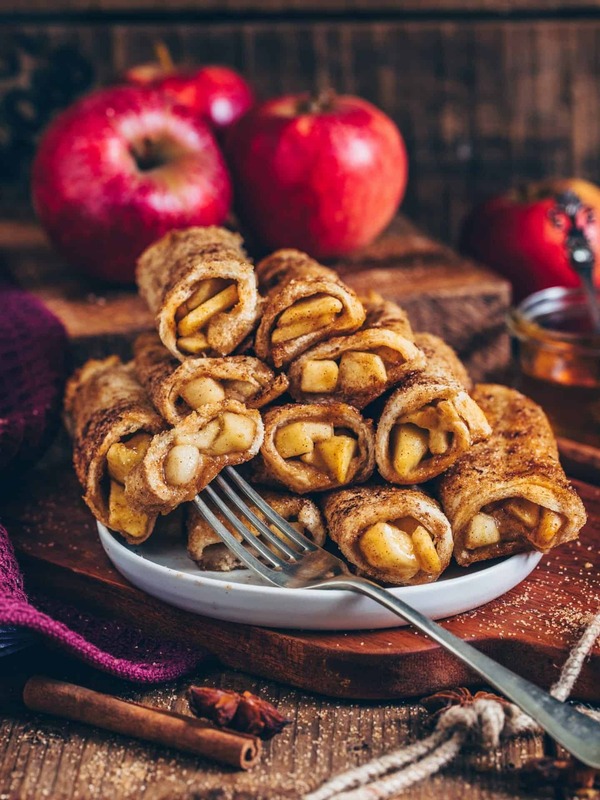 As mentioned before these delicious vegan Apple Pie Roll-Ups are super easy to make. 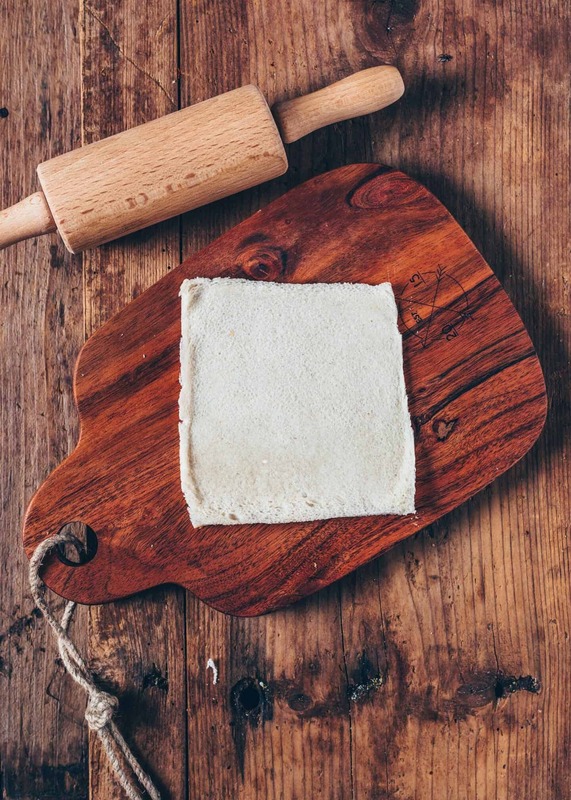 To prepare the “toast pastry”, cut off the crusts from each slice of your favorite bread and flatten using a rolling pin. 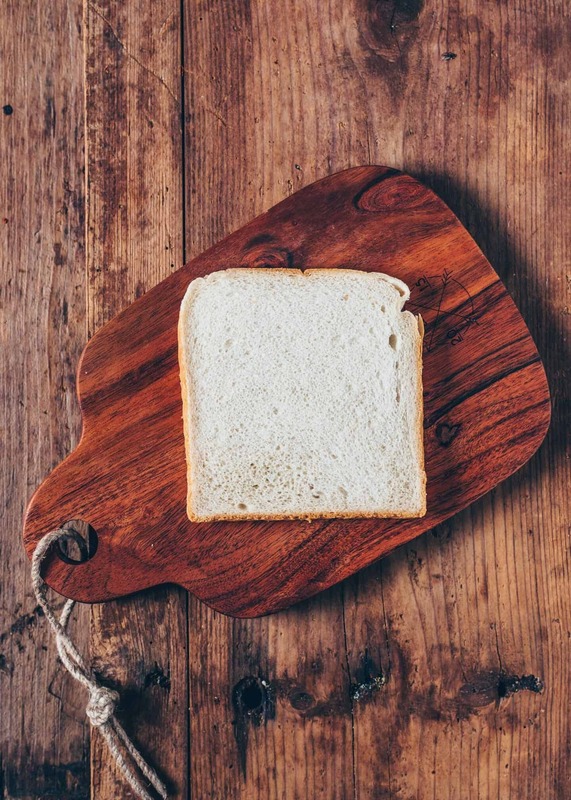 I prefer using regular soft wheat bread because you’ll get the best result in texture and crispness then. But feel free to use whatever bread you like. 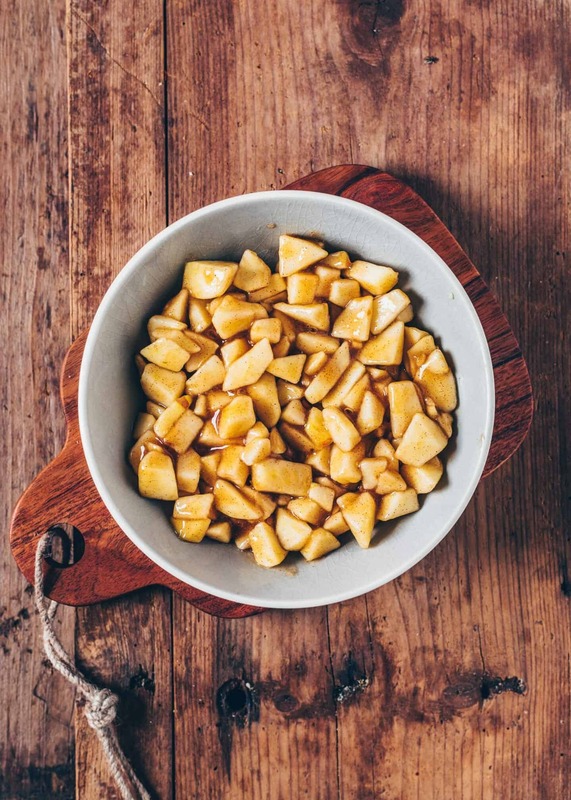 Each toast is loaded with a sweet apple cinnamon filling, then topped with brown sugar and more cinnamon. 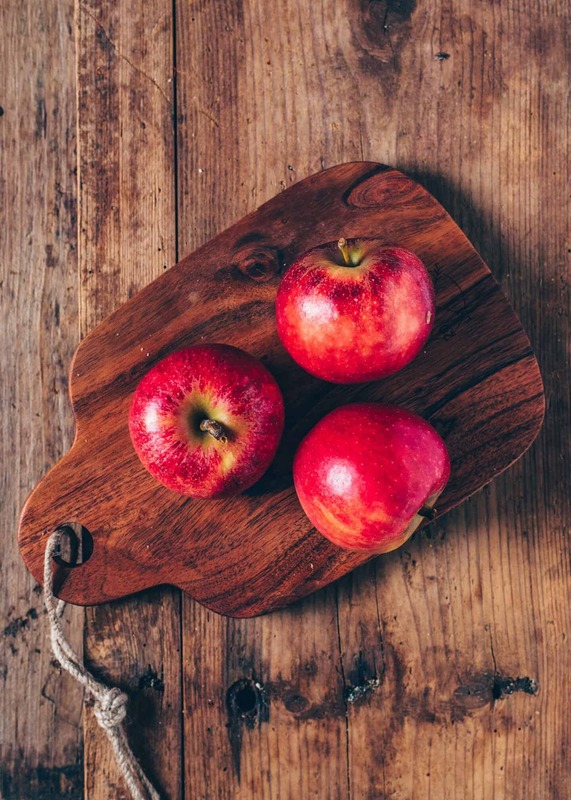 To make the filling, peel, core and finely chop the apples. 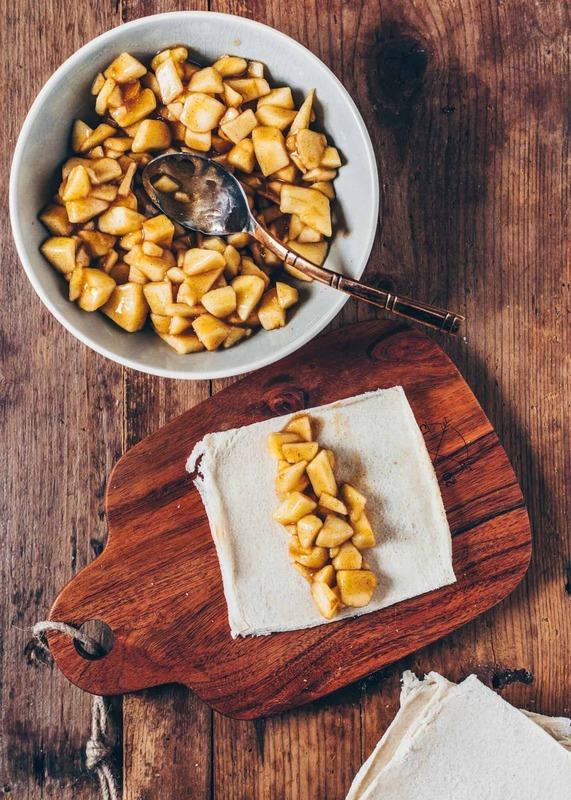 In a pot, combine water, cornstarch, brown sugar, cinnamon, and vanilla and bring to the boil to thicken while stirring. 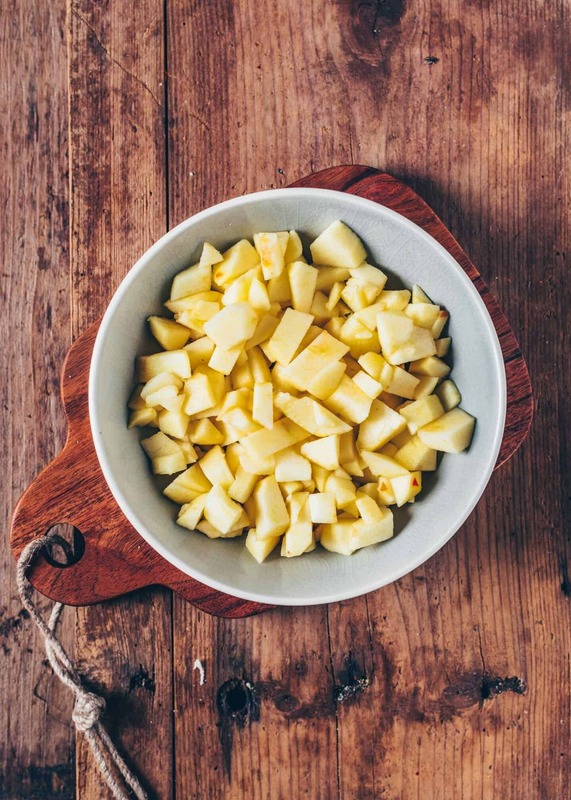 Then stir in chopped apples and set aside. 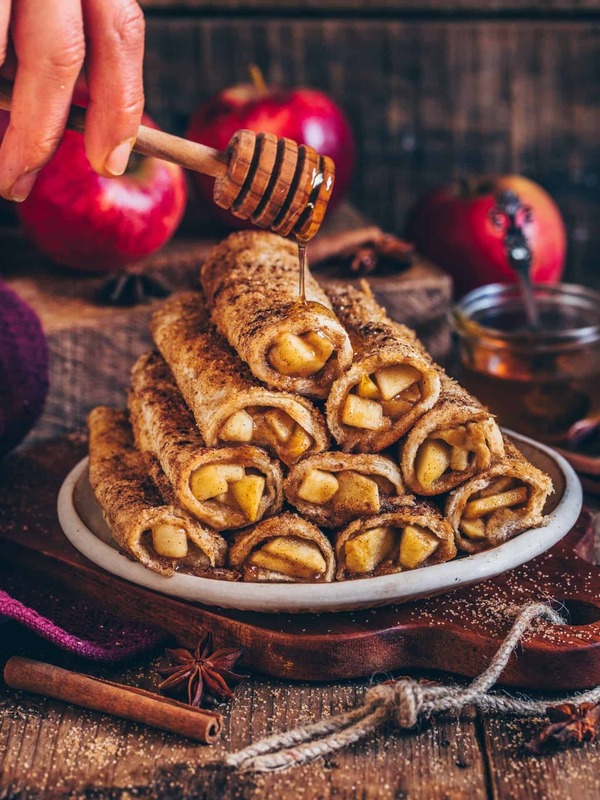 Once the apple filling has cooled a little, spread about 1-2 tablespoons of the filling on your flatten toast slices and roll it up into a wrap. Then brush or dip into melted vegan butter and cover with cinnamon sugar. 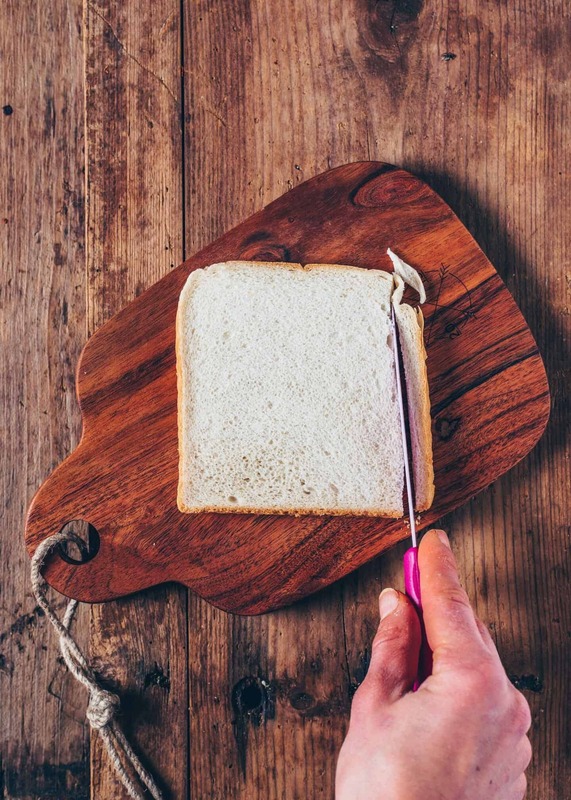 Don’t be afraid of dipping into butter because the bread slices get a firm texture by flattening them, so they won’t soak any butter. The butter is just necessary to cover the outside, so the cinnamon sugar sticks on it and your bread get crispy during baking. 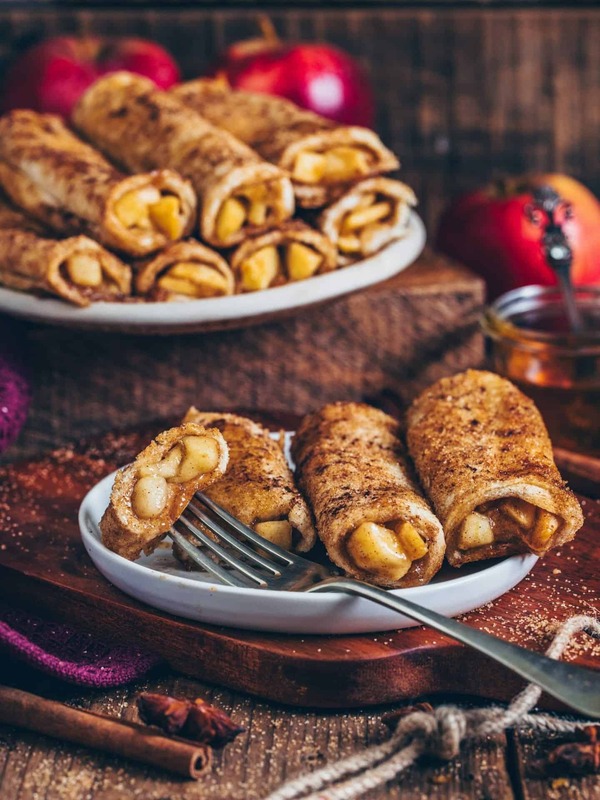 These vegan oven baked Apple Toast Roll-Ups are super easy to make in just 20 minutes. 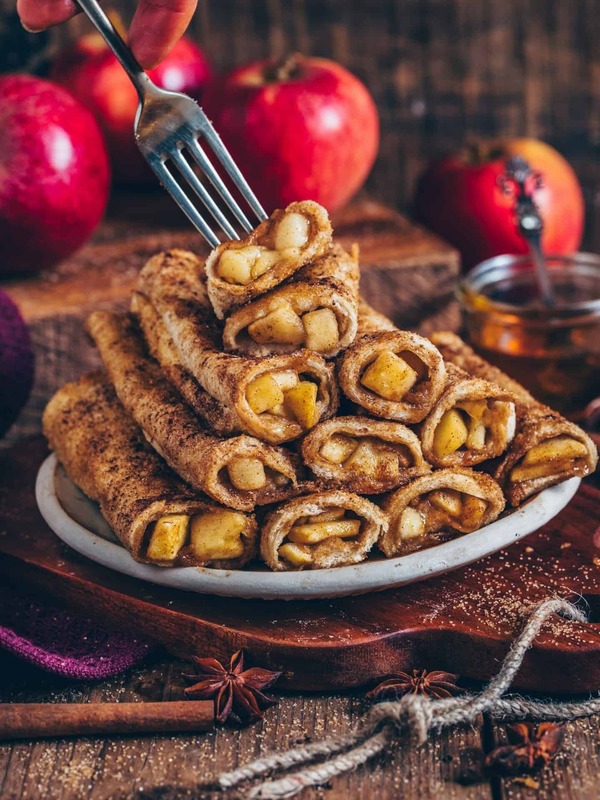 It’s a delicious breakfast or dessert with a sweet apple cinnamon filling. Serve them warm and crispy for a perfect snack. Preheat your oven to 350˚F (180˚C). 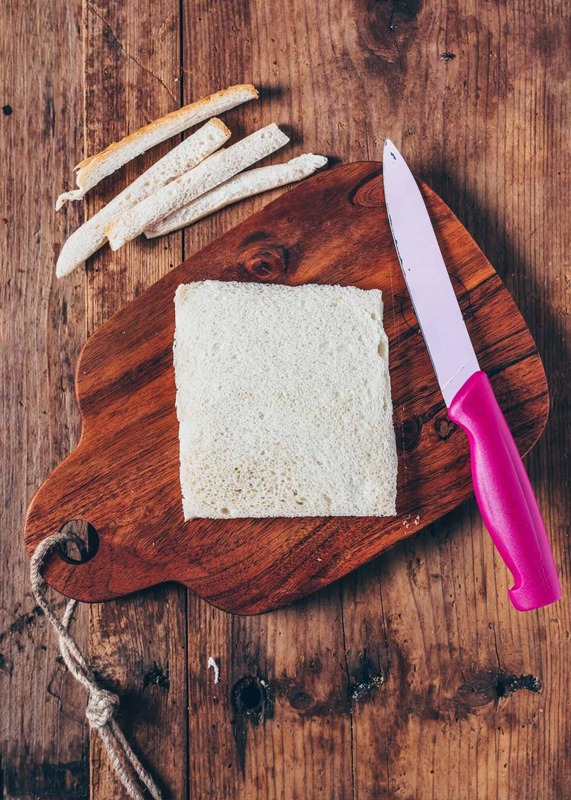 Cut off the crusts from each slice of your bread. 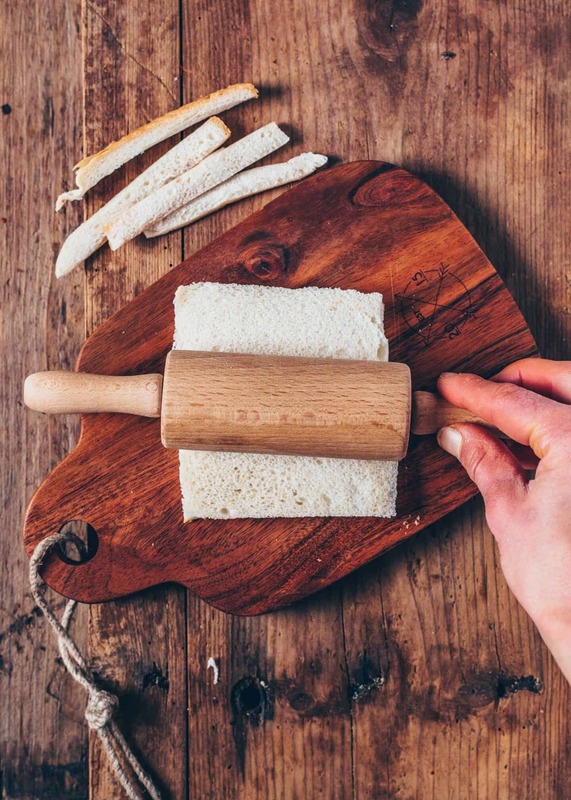 Then flatten using a rolling pin. 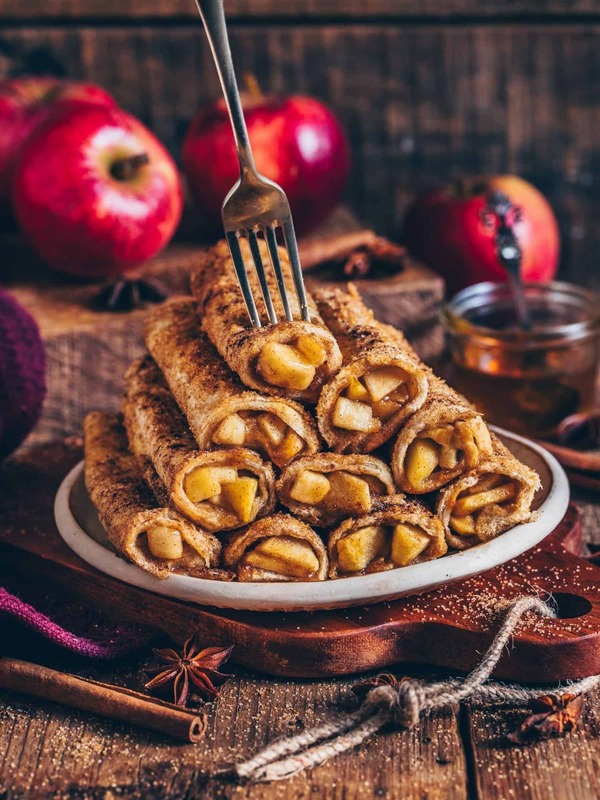 Spread about 1-2 tablespoons of the apple pie filling on the flatten toast slices and roll them up into a wrap (see pictures in the text above). 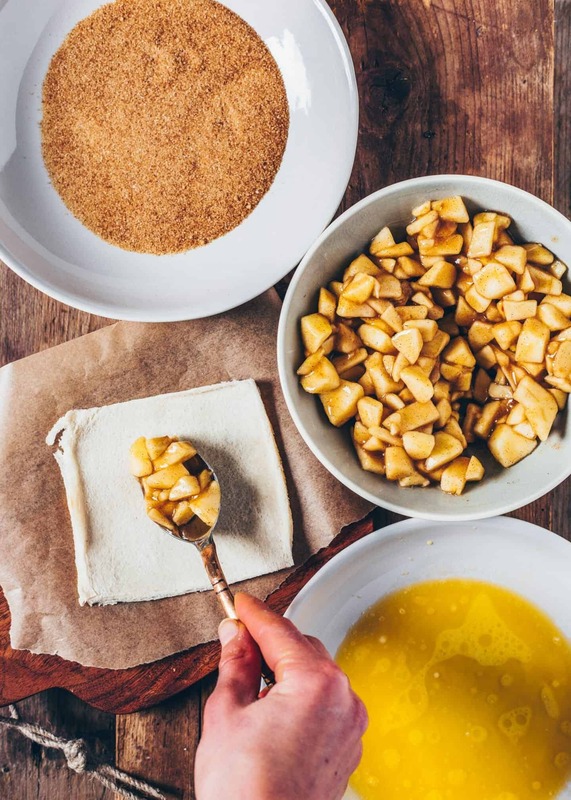 Combine brown sugar and cinnamon in a flat bowl (or deep plate). Melt vegan butter and pour in another flat bowl. 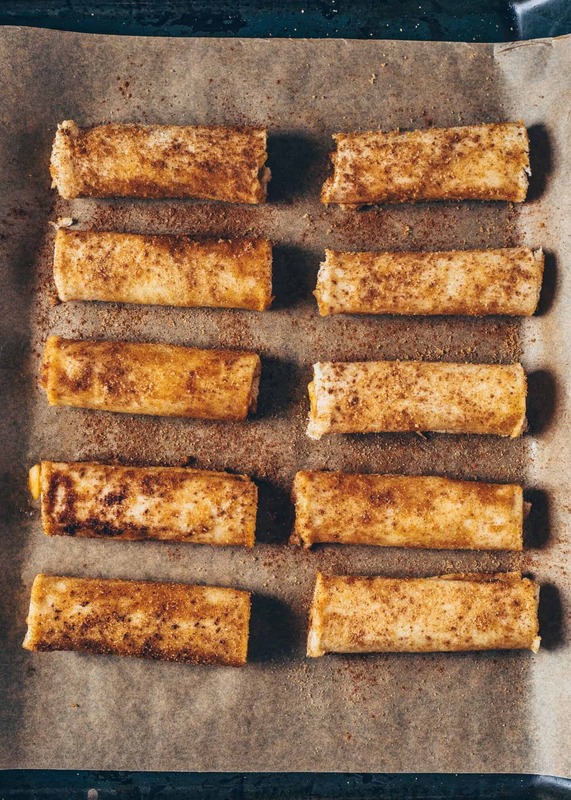 Brush or dip each toast roll-up into melted butter and then roll in the cinnamon sugar. Place them on a baking sheet lined with parchment paper and bake for about 15-20 minutes until crispy and golden browned. 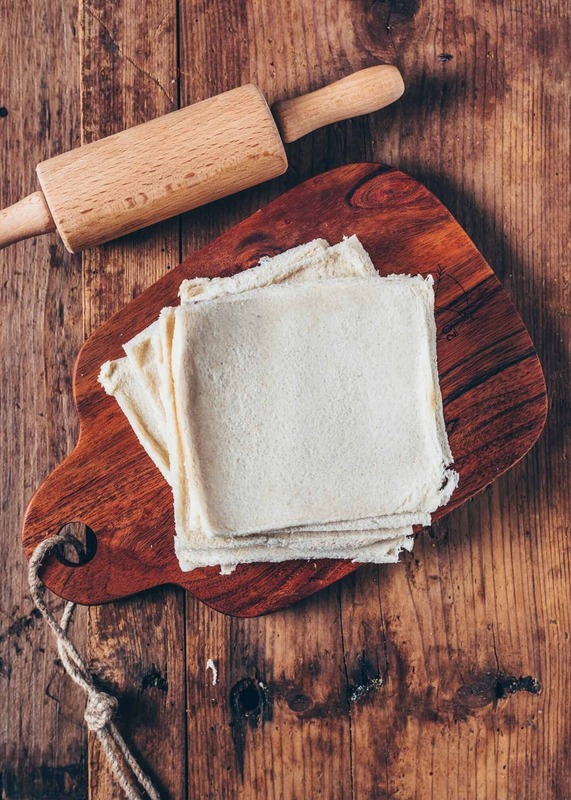 To make these Roll-Ups gluten-free, you can use a gluten-free bread. To make them refined sugar-free, you can use brown erythritol. 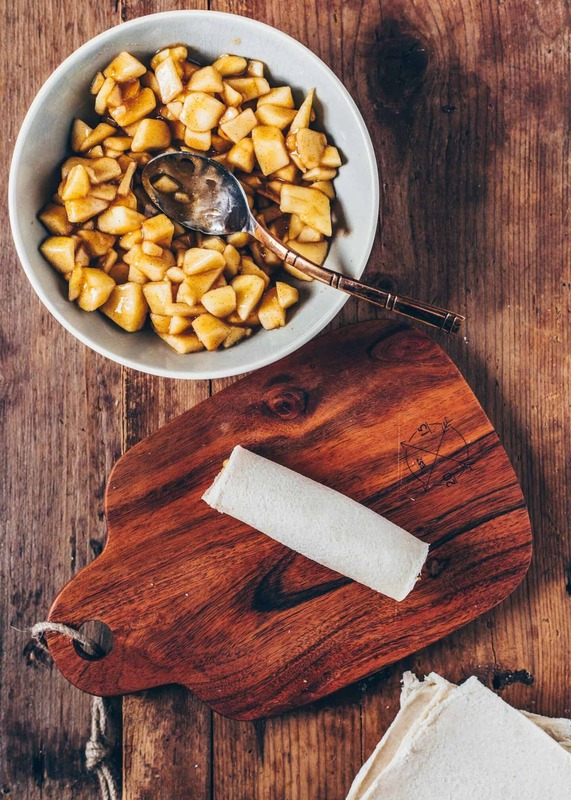 You could also use coconut sugar, or regular white sugar, if you prefer. can I replace the cornstrach and lemon juice with something else? You could use pudding powder instead. The lemon juice is not necessary. You can simply omit it. It’s just for a fresh taste. Thank you so much, Klaudia! A great recipe!!! Easy to make and delicious 😋 I love it thanks for sharing!!! I set out to make these tasty roll-ups, but I opted for a gluten free bread. The bread I used, just wouldn’t roll out and just crumbled to bits. I decided to salvage the apple pie filling and throw it on top of a bread pudding base. I used gluten free bread, apple sauce, almond milk, cinnamon, vanilla, and created a bread pudding base. I topped the apple pie filling over the top and drizzled vanilla icing (almond milk and confectioners sugar). It was so good and such a huge crowd pleaser! I just made that yesterday with bananas and it’s AMAZING! !😍 perfect snack idea!